For several years I’ve been sharing Schwartzbeeren seed and growing instructions with people in many states and some Canadian provinces. My purpose is to ensure that this traditional Volga German crop will continue to be grown and that people will continue to enjoy some of the traditional dishes in which Schwartzbeeren are used. My mother, Alexia Herman Brungardt, used to see that I would have fresh seed to share. While she still gardened, she grew the berries herself. Sometimes she’d buy Schwartzbeeren at the Farmers Market in Hays. Mom would dump the berries in a bowl of water, pop them with her hands to free the seeds, skim the empty skins off the surface of the water, then drain the seeds in a fine wire strainer. She’d then spread the seeds on rags or paper towels, leaving them in a warm, airy place until they had dried thoroughly. When the first Volga German immigrants settled in Kansas in the 1870s, they brought seeds from Russia. I don’t know of any Russian vegetable varieties that are still grown in Ellis and Rush counties, but many gardeners of Volga German descent grow Schwartzbeeren, perhaps a testament to their esteem for the berries and the plants’ ability to grow under harsh conditions. Schwartzbeeren (literally, “blackberries” in German) are an edible form of common or black nightshade, Solanum nigrum. Although related, Schwartzbeeren are not the same as the garden huckleberry, wonderberry, or sunberry. Depending on the colony they came from, Volga Germans may have called Schwartzbeeren by other names: Nachtschatten (nightshade); schwartzer Nachtschatten (black nightshade); yagoda (which means “berry” in Russian); and even Scheißbeeren (shitberries, a man from north-central Iowa told me). 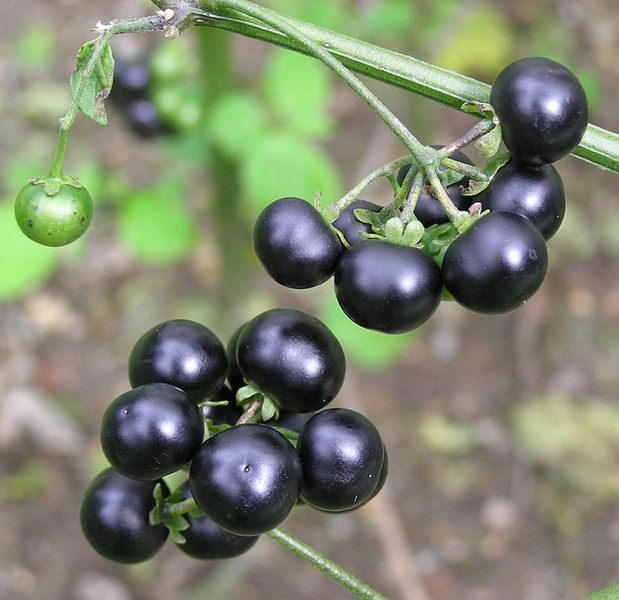 In Russian, black nightshade is called paslen cernyj. This garden crop was probably developed as generations of gardeners saved the seed from plants whose berries were low in the alkaloids that make the species acrid tasting and somewhat poisonous. We’ll probably never know whether this selection took place in Germany or in the German colonists’ new home along the Volga River in Russia because Solanum nigrum is native to much of Eurasia. What we do know is that the Volga Germans valued these berries enough to bring seed along when they immigrated to North America. This crop seems to have found the hot, sunny and rather dry summers of the Great Plains and Intermountain states of the West especially to its liking. Traditionally, Schwartzbeeren were grown as a volunteer crop. They were never intentionally planted. Instead, seedlings came up “volunteer” once the soil had warmed in the spring from seed that had been produced and dropped to the ground the summer before. The gardener then spaced the Schwartzbeeren plants by hoeing out or pulling up the excess seedlings. Schwartzbeeren plants grow 2 to 3 feet tall, depending on how far apart they are spaced, how much water they receive during the growing season, and the fertility of the soil. Since volunteer Schwartzbeeren come up in the garden at about the same time as volunteer tomatoes, one can conclude that the conditions that are conducive for good germination of tomato seeds are the same ones that Schwartzbeeren seeds require: a soil temperature of 70 to 90 degrees F. So, start your Schwartzbeeren as you would tomatoes. Sow the seed indoors a month to six weeks before the frost-free date for your area. It will take 6 to 14 days for the seedlings to emerge. After the seedlings are large enough to handle (about the time they have their first true leaves), transplant them to small pots. Or, simply sow the seed in a sunny place in the garden a couple of weeks before the frost-free date for your area, covering it with a scant 1/8 inch of soil. Thin or transplant the seedlings to stand 2 to 3 feet apart. Schwartzbeeren berries are about 1/4 inch in diameter and are produced in clusters of 5 to 10. They consist of a thin, purple-black skin filled with juice and many small seeds. Schwartzbeeren are fully ripe when the skins of the berries have turned from green to a dark purplish-black and have lost their sheen. If the berries are picked before they are dead ripe, they will not be as sweet as they could be and they will have unattractive, green juice. To pick Schwartzbeeren, “tickle” them from their clusters; do not pinch or squeeze the berries hard or they will burst. The flavor of Schwartzbeeren is rather difficult to describe; the berries are sweet, with a somewhat acidic flavor. The Volga Germans enjoyed their beloved Schwartzbeere’ in several ways. They used the berries, mixed with sugar and flour and perhaps egg and cream in a topping for Schwartzbeere’kuche’. They also used the berries, mixed with sugar and a little flour, to fill Maultasche’, a filled pasta similar to pirogi or vareniki. And sweetened Schwartzbeeren were sometimes put over dumplings that had been slathered with Schmeltz, a rich butter and cream sauce. Volga Germans who immigrated to North America also learned to use the berries for pie, coffeecake and jam. Recipes using Schwartzbeeren can be found in the Sei Unser Gast (Be Our Guest) cookbook, which I edited for the North Star Chapter of Germans from Russia. To order the cookbook, go to http://www.northstarchapter.org/Cookbook.html on the Internet or write to Cookbook Orders, North Star Chapter of Minnesota, PO Box 583642, Minneapolis, MN 55458-3642. I hope you all try growing Schwartzbeeren so you can enjoy eating them. Schwartzbeerenmaultaschen are berry-filled noodle dough, sort of giant-size Volga German ravioli, pirogi, or vareniki. While this recipe uses Schwartzbeeren, a type of edible black nightshade (Solanum nigrum) for the filling, another type (Käsemaultaschen) uses dry curd cottage cheese. First, make a dough: Mix together 2 cups flour, 2 slightly beaten eggs, 1/2 tsp. salt, and 4 Tbsp. milk. Knead until the dough is smooth and moist, but not sticky. Wrap the dough in plastic wrap or put it in an airtight container and let it rest 30 minutes to 1 hour. This makes it much easier to work with. Next prepare the filling: Very gently mix together 1 qt. Schwartzbeeren, 1/4 c. flour, and 2/3 to 1 cup sugar. Mix the filling very gently as the berries have tender skins and are easily smashed. A good way to do this is to place about a cup of berries in a large bowl, sprinkle them with a fourth of the flour and sugar and repeat this until all the berries, flour and sugar are used up. On a lightly floured surface, roll the dough out 1/8 inch thick. Cut this into 4-inch squares. The easiest way to construct the Maultasche’ is to cup your hand slightly, lay a square of dough in the palm of your cupped hand, and place a heaping tablespoon of the filling in the center of the dough. Then bring the corners of the dough together over the filling and pinch the neighboring edges together. The result will be a pyramid-shaped noodle pocket. Carefully drop two or three Maultaschen into the boiling water and boil them gently for 5 minutes after they rise to the surface. As the Maultaschen are cooked, remove them from the water with a slotted or pierced spoon (a Schaumlöffel), drain well, and place them in a dish. If you run out of filling before you run out of dough, cut the dough into pieces and cook in the boiling water (my Grandma, Elizabeth Haberkorn Herman, called these “Leppchje,” which means little flaps or patches). Keep the Maultaschen warm while you prepared the fried bread crumbs and onion and Schmeltz. In a skillet, melt 1/4 cup of butter. Add 1 cup of coarse crumbs (made by tearing up some stale white bread), and 1/4 cup of chopped onion. Saute, stirring occasionally, until the crumbs are a nice golden brown and the onion is translucent. Remove the crumbs and onion to a dish and set aside. To make the Schmeltz, melt 1/4 cup of butter in the skillet. Stir in 1/2 cup of sweet or sour cream and cook until the mixture boils all over and starts to thicken. Pour the Schmeltz over the Schwartzbeere’maultashe’. Garnish with the browned crumbs and onion and enjoy. This recipe is for a sheet Kuchen, what is known in Germany as Blechkuchen, and to the Volga Germans as dinne’ Kuche’ (dünner Kuchen, or thin Kuchen). over, cover, and let rise until double in bulk. Punch down the dough and let it rise again. Roll out the dough about 3/8 inch thick and put it on a greased baking or cookie sheet, making a raised ridge around the perimeter of the dough with your fingers to contain the topping. Make the topping: Distribute about 3 cups of Schwartzbeeren over the rolled out dough. In a bowl, beat together 2 Tbsp. flour, 3/4 c. sugar, 1/4 c. cream, and 2 eggs. Pour this all over the berries. Dust with cinnamon. Bake the Schwartzbeere’kuche’ until the edges of the crust are nicely browned and the filling is set, about 40 to 45 minutes. Take the Kuchen from the oven, brush the edges with melted butter, and let cool on a rack. Place the Schwartzbeeren in the pie shell. In a bowl, blend the flour with a little of the cream until smooth. Then add the rest of the cream, the egg yolks (save the whites for the meringue that will go on top the pie), salt, and sugar. Mix thoroughly and then pour over the berries. Bake the pie 5 minutes, then reduce the heat to 325 degrees F. and bake until the custard is well set (a knife blade inserted into it should come out clean). Remove the pie from the oven and top with the meringue. Return the pie to the oven and bake 12 to 15 minutes more, or until the meringue is golden brown. Let cool before serving. Meringue: Put 3 egg whites, 1/4 tsp. cream of tartar and a pinch of salt in the bowl of an electric mixer. Beat on medium speed until soft peaks form. Add 6 Tbsp. sugar, 2 Tbsp. at a time, beating after each addition. Beat 3 to 5 minutes longer, until all the sugar is dissolved and the whites are satiny and form stiff peaks. Apply the meringue to the hot pie, smoothing it to the edges of the crust to keep it from shrinking. Make peaks in the meringue with the back of a spoon. I have an opportunity to get some seeds for Schwarzbeeren, and will see if I can grow them here. If anyone else is interested in getting some seeds, please let me know and I will try to arrange it. Sounds interesting. Currently I have neither time nor garden to grow these, but in the future I would be interested in trying it. I'm curious as to the flavor, it sounds very good from the description. I've got a picture in my head of how they taste, but I won't know for sure unless I actually try them. I've sent a reply to the fellow that made the offer - hopefully, I will hear from him soon.